in shining spirit image cast. and Heaven’s peace doth softly reign. Only an inconspicuous tuft of hair on the forehead of Christ provides continuity throughout art history and suggests the cloth of Manoppello as a prototype. The blurred contours on the shroud of Turin by themselves could not produce such a precise representation. Despite the prohibition of idolatry in the Old Testament and the Byzantine dispute over images, the Christians’ need to create an image of Christ prevailed. 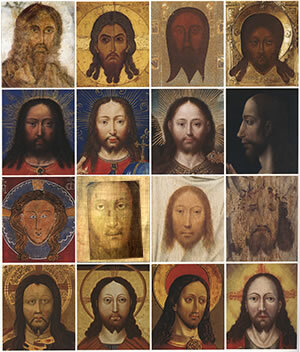 In his book “Das Antlitz Christi” (The Face of Christ), published in 2005, Andreas Resch exposed works such as the “Good Shepherd” (Priscilla Catacomb) as hidden images of Christ. He applied the principle of superimposition developed by Sister Blandina to early Christian paintings in the Roman catacombs and to icons to prove the congruence of various grave cloths. Until the 17th century, numerous works of art exhibited the characteristics of the sudarium of Manoppello and bore remarkable resemblances to it, such as the Vera Icon on the sweat cloth of the Master of Flémalle (probably between 1375-1444). In these reproductions, which corresponded closely to the original, only the face and hair – with or without the cloth – were depicted. The sudarium served as the original for the icons both in the East (Byzantium) and the West with regard to the development of a concept of divine beauty subject to geometry. This is true not only of copies of and templates for icons, but also for freestyle reproductions. Many representations show the influence of the era in which they were created, as the relevant artistic principles of the time were implemented, e.g. in portraits. Occasionally an older style of painting was used to enhance the authenticity of the likeness. The facial expression also reflects the role assigned to Christ. The depiction of the sudarium is often integrated in a pictorial narrative. For example, the origin of the relic is explained in various ways by the introduction of supporting figures. When Veronica presents the image on the cloth for veneration, the portrayals of the relic and the legend are united in one picture. Angels holding the image of Christ underscore its divine origin. The fact that the fall of the folds does not continue in Christ’s countenance, so that the image quasi floats in front of the fabric, indicates a supernatural origin.